An important aspect of being a solopreneur and growing your own business is finding and learning from mentors. Those who have turned their solopreneur opportunity into a success possess wisdom from which we all can learn. The obstacle is actually locating and befriending a notable solopreneur or entrepreneur. Many of us have no means of connecting personally with people of such notoriety. Books, however, can be our mentors. We can spend hours upon hours gleaning the very best a mentor has to offer at our leisure; and without the doughy stickiness of relationships. What better arrangement can there be than having the best of a mentor with no strings attached? The following are some recommended books from some of the best solopreneurs and entrepreneurs of our day. Some may not fit your particular style or business intent. But you’ll no doubt find several from which you can learn much that will help you launch your business and find success. Pat Flynn is an entrepreneur, blogger, public speaker, and podcaster, whose blog boasts over 150,000 active members and is packed with some of the best content on the web. Pat considers himself to be “the crash test dummy of online business,” so his advice will be excellent reading to help you turn your business into reality. Are you a solopreneur on a budget? If your dream is to quit your boring and mundane day (or night) job, work for yourself, and live a more rewarding lifestyle, start with a $100 Startup. In addition, this book is a great motivational read. It explains that you really don’t need a college degree or throw tons of money at your idea to get started. Whether you run one or two or three businesses, there’s some great things to take away from Tim’s unique storytelling backed with some exceptional tips and advice. Get it, read it and apply yourself. Continuous innovation really matters in ensuring your business takes off and grows successfully. Whether you’re a solopreneur or an entrepreneur with a small company, how to test, adapt, and adjust your business is key knowledge to maintain your success. You’ll find great advice for all three in this book. Gary is an investor, entrepreneur, public speaker, best-selling author and founder of Vaynermedia. #AskGaryVee showcases some of the best questions and answers regarding leadership, social media, and self-awareness. An awesome book you’ll love reading. If you’ve got a passion, an obsession that you can’t stop thinking about, this book is a must for you. Learn to take your passion and turn it into a real profitable business using the power of the Internet. Highly recommended if you want to learn from the best as well as get totally inspired. Stop waiting for the perfect time to begin and start now! Every now and then we all need a good kick in the rear to get us moving. Author Dan Meredith does a grand job of making you want to get up and get stuff done by sharing some great advice and principles you can take action upon immediately. Beware: you may find some of the language he uses offensive, but the content in his book is priceless. New York Times bestselling author Grand Cardone affirms that goals and actions are critical elements of attaining success, in business and in life. Discover the principle of goal setting and taking massive action on another level entirely. If you’re stuck in a rut in your online business or your blog, or indeed with your own personal life, read this book. This book shares very truthful and interesting theories, insights, and real-life facts about ‘multi-tasking’ and how tackling more than one thing at a time in your business can kill productivity. The book suggests taking one thing at a time and crushing it before moving onto the next thing, whether it’s a task or goal. This is a fabulous read for budding and veteran solopreneurs. It is filled with real-world, practical examples of how an idea can go viral through the tiniest, most insignificant changes. As a solopreneur, it can be easy to feel overwhelmed by an imagined need to do everything on your own. This book teaches you the networking skills necessary to grow a massive network of friends, supporters and fans around you, to spread your idea. I’m likely not the only reader who found great inspiration from Coelho’s fiction classic. While it has become somewhat of a cliché for encouraging others to follow their dreams, it still illustrates some of the best advice I’ve ever received: embrace fear, work with the end in mind, learn through taking action, don’t compare yourself to others, and maintain enthusiasm. If you’re only thinking about solopreneurism, start here. Discover how to include the three elements in your business that are critical to your success. You can become a successful solopreneur /small business owner. This information can assist you to ensure that you don’t experience a lot of roadblocks along the way. You are going to work hard, and that hard work can really be empowering when you are passionate and experiencing results. How about it? 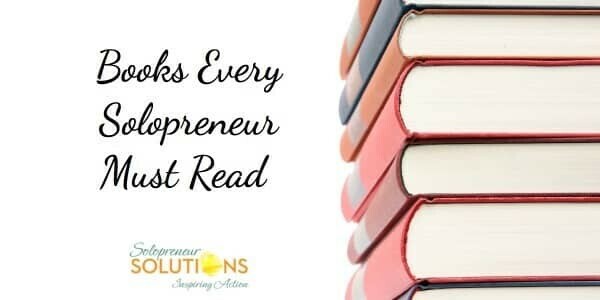 What are your favorite books that provide just what you needed for launching your solopreneur business and propelling it forward? Share them with us in the comments below. These are some gems Donna. Great to see your book on the list too. Gary Vee, Coelho and Pat Flynn are flat out fabulous. Everybody and book on this list is inspired. Marios thanks for reading. I would start with Will It Fly and then move on to The One Thing.